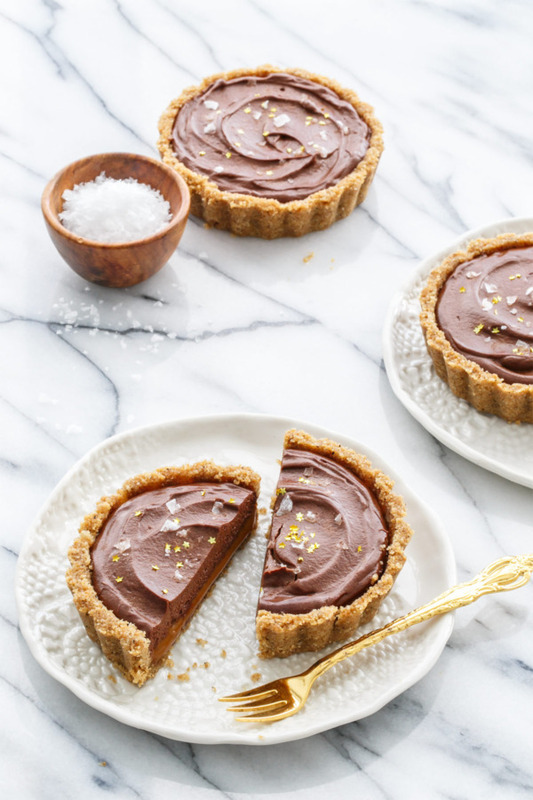 One of my favorite no-bake dessert recipes is this Tart Cherry & Chocolate tart, the light and airy mousse-like ganache filling is simply beyond description. You don’t expect something so light to be so rich and decadent, and yet, that’s exactly what it is. And while the cherry version is fine and dandy, downright delicious in fact, it was a recipe ripe for adaptation: simply swap in a lightly spiced vanilla cookie crust and a layer of creamy, luscious dulce de leche, and you have yourself another winner. This version is just as good as the cherry one, with its own unique charm. 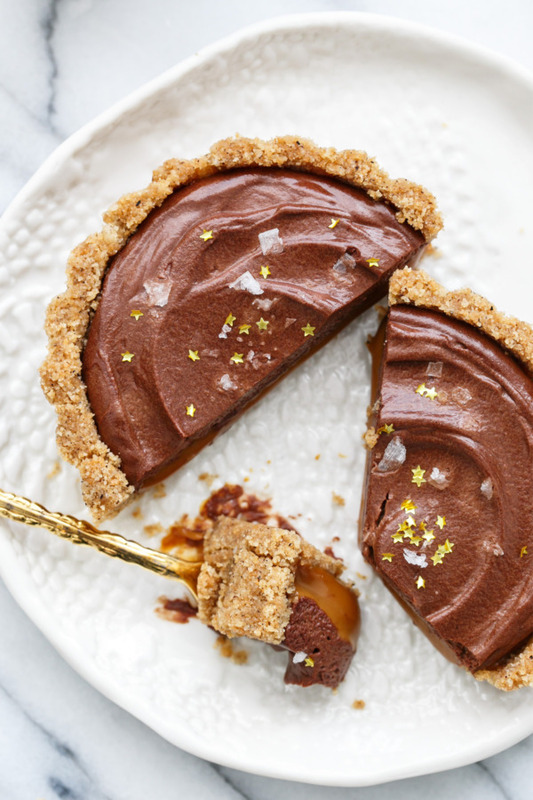 Whereas the cherry is bright and fruity, the dulce de leche is lavishly creamy, with a hint of cinnamon spice in the crust that makes it a perfect adaptation for fall. Flake sea salt is pretty much nature’s glitter. 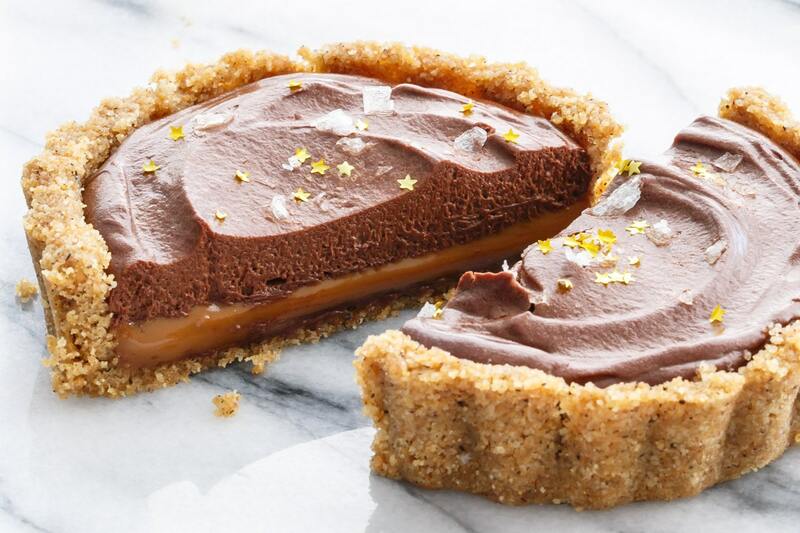 Of course, the edible glitter stars don’t hurt the presentation, either, but it’s that hint of salt at the edge of your palate that cuts through the richness and heightens the intensity of the dark chocolate, the caramel, and the spices. Basically, chunky flake sea salt is like glitter for your tongue. 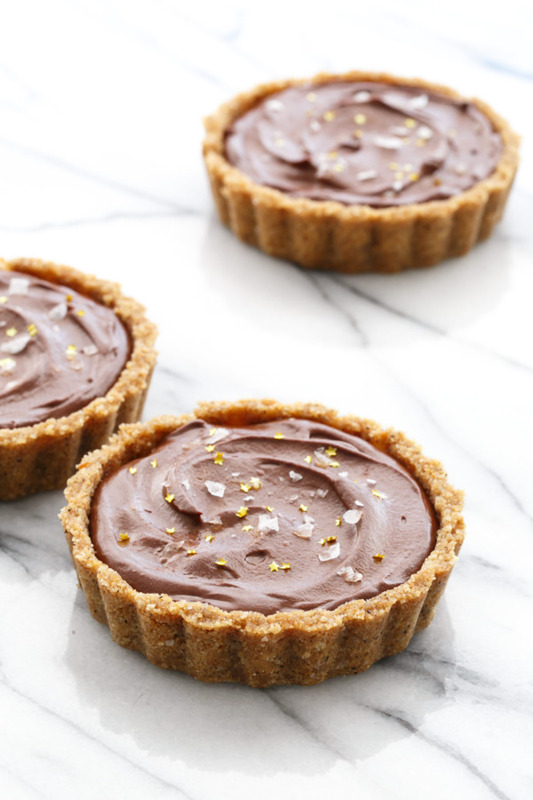 This tart is best served at room temperature about 2 hours after it is made. 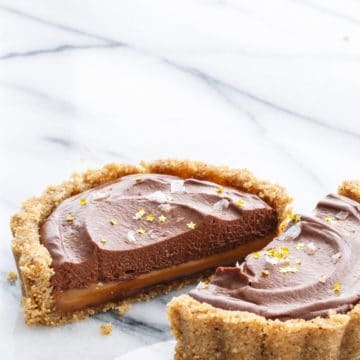 In the cool months, letting it sit at room temperature for 2 hours will yield a perfectly set and sliceable tart, yet still with a divinely soft and airy texture that is nothing short of heavenly. In warmer months, or if you find yourself short on time, refrigerate it for 15 to 45 minutes or until the filling is set but still glossy. Any longer than that and the filling will go matte in appearance and the texture won’t be quite as mousse-like, though if you let it return to room temperature before serving I’m betting you no one will notice the less-than-shiny luster… they’ll be too busy stuffing their faces. 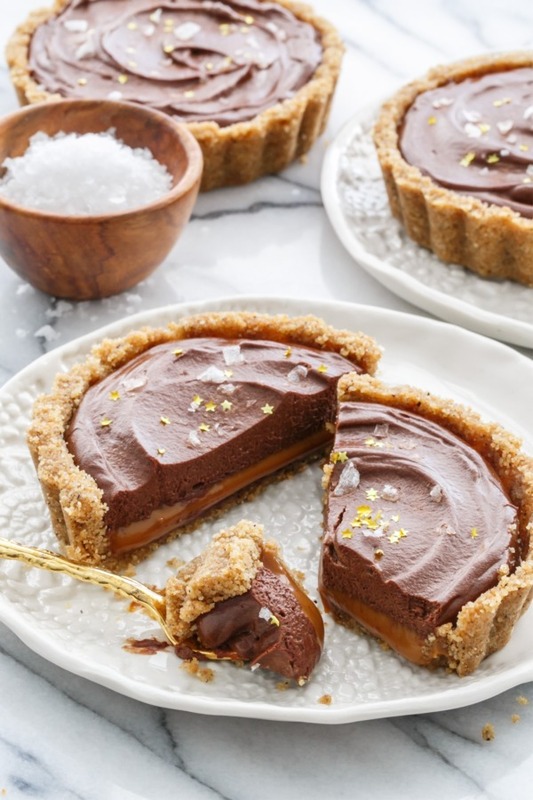 This no-bake dessert has it all: a rich and airy chocolate ganache mousse with a layer of creamy dulce de leche caramel, nestled in a sweet, salty and lightly spiced cookie crust. To prepare crust, finely chop wafer cookies in a food processor. Add sugar, salt, and cinnamon and pulse to incorporate. In a microwave-safe bowl, microwave butter for about 45 seconds or until melted. Pour into cookie crumb mixture and fold until incorporated and crumbs are evenly moistened. Dump into a 9-inch round tart pan (or equivalent, such as six 4-inch mini tart pans) with a removable bottom. Press firmly onto bottom and up the sides (use a tamper or a small flat-bottomed glass to help if necessary). Refrigerate at least 30 minutes or until set. Combine dulce de leche and cream in a microwave-safe bowl. Depending on the consistency of your dulce de leche you can add more or less cream. Less cream will yield a firmer, thicker caramel that stays put, and more cream will make it softer and oozier. I used Trader Joe’s brand jarred dulce de leche and found that 3 tablespoons of cream was perfect. If you are using jarred caramel, which is generally thinner than dulce de leche, you probably don’t want to use any cream at all. Microwave for 45 to 60 seconds, stirring once, until caramel is smooth and cream is completely incorporated. 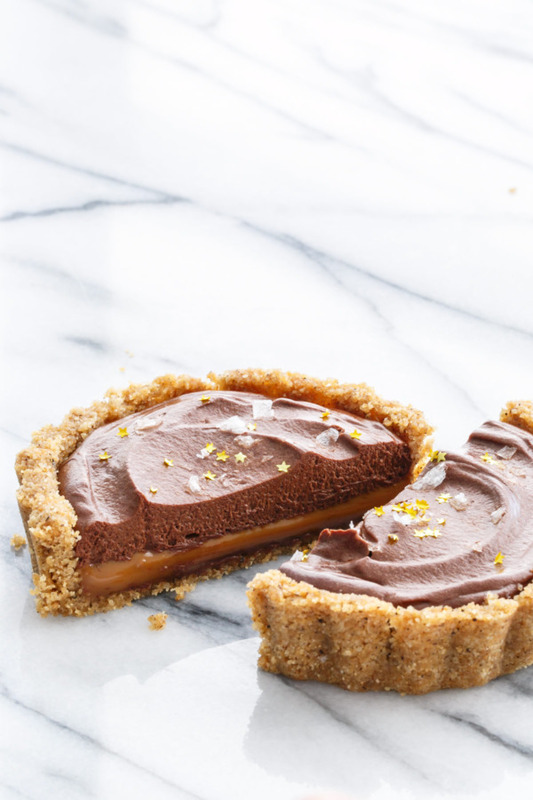 Spread dulce de leche in an even layer in the bottom of chilled crust. Return to refrigerator to chill while you prepare the chocolate layer. 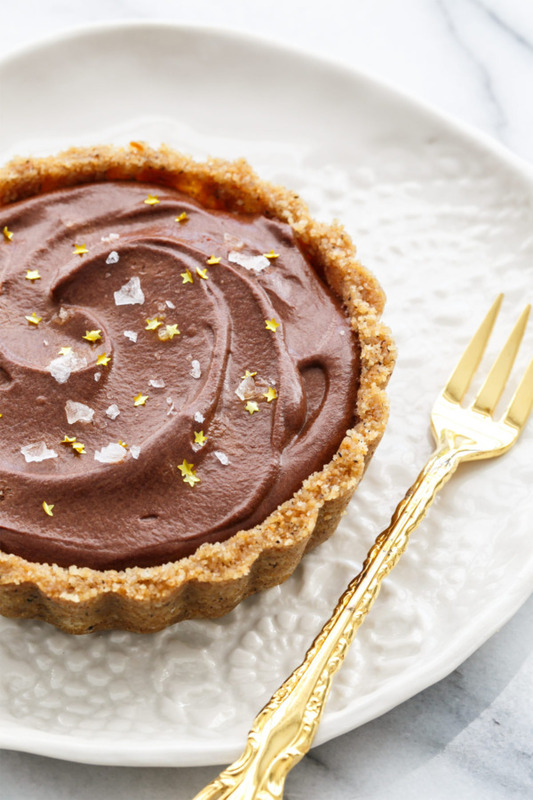 For ganache mousse, place chopped chocolate in a heat-proof bowl. The finer you can chop this chocolate the better. Heat 3/4 cup of cream in a small saucepan until it just begins to bubble (do not let it fully boil). Pour warm cream over chopped chocolate. Let sit for 30 seconds, then begin to gently whisk, making small concentric circles in the center of the bowl, until chocolate is melted and smooth. Add butter, 1 chunk at a time, whisking slowly until incorporated before adding the next chunk. Stir in vanilla. In a clean bowl, vigorously whisk remaining 1/2 cup cream until it forms soft mounds (you’re looking for a slightly softer consistency than typical whipped cream). Fold into melted chocolate mixture until smooth and no white streaks remain. Pour chocolate mixture on top of dulce de leche and spread into an even layer. Let sit for 1 to 2 hours at cool room temperature or refrigerate for 30 to 60 minutes just until set (if refrigerated longer, the top won’t be as glossy.) Lift out of tart pan using removable bottom and slice. Sprinkle with flake sea salt and edible glitter (if desired) just before serving. Tart will keep, covered and refrigerated, for up to 2 days. Let come to room temperature prior to serving.